72 SMT007 MAGAZINE I JULY 2018 be longer than the distance between the two adjacent annular rings. By ensuring this is met, the probability of webbing is signifi- cantly reduced as surface tension will draw the solder to the nearest copper area. In cases where the lead length is too long, component prep and lead trimming are recommended to provide the desired length. 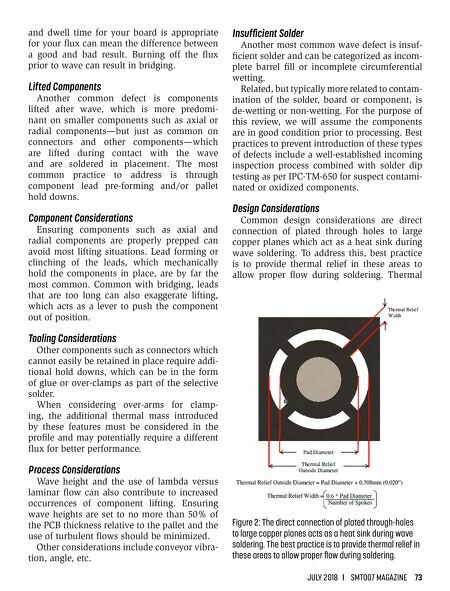 Other considerations related to the compo- nents themselves can be PCB contamination, component contamination, oxidation or solder mask issues. 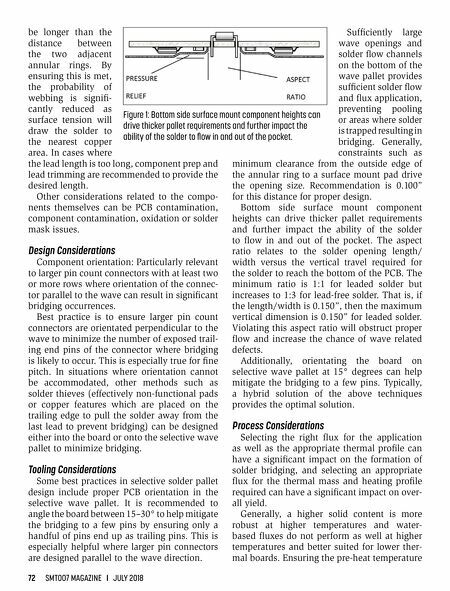 Design Considerations Component orientation: Particularly relevant to larger pin count connectors with at least two or more rows where orientation of the connec- tor parallel to the wave can result in significant bridging occurrences. Best practice is to ensure larger pin count connectors are orientated perpendicular to the wave to minimize the number of exposed trail- ing end pins of the connector where bridging is likely to occur. This is especially true for fine pitch. In situations where orientation cannot be accommodated, other methods such as solder thieves (effectively non-functional pads or copper features which are placed on the trailing edge to pull the solder away from the last lead to prevent bridging) can be designed either into the board or onto the selective wave pallet to minimize bridging. Tooling Considerations Some best practices in selective solder pallet design include proper PCB orientation in the selective wave pallet. It is recommended to angle the board between 15–30° to help mitigate the bridging to a few pins by ensuring only a handful of pins end up as trailing pins. This is especially helpful where larger pin connectors are designed parallel to the wave direction. Sufficiently large wave openings and solder flow channels on the bottom of the wave pallet provides sufficient solder flow and flux application, preventing pooling or areas where solder is trapped resulting in bridging. Generally, constraints such as minimum clearance from the outside edge of the annular ring to a surface mount pad drive the opening size. Recommendation is 0.100" for this distance for proper design. Bottom side surface mount component heights can drive thicker pallet requirements and further impact the ability of the solder to flow in and out of the pocket. The aspect ratio relates to the solder opening length/ width versus the vertical travel required for the solder to reach the bottom of the PCB. The minimum ratio is 1:1 for leaded solder but increases to 1:3 for lead-free solder. That is, if the length/width is 0.150", then the maximum vertical dimension is 0.150" for leaded solder. Violating this aspect ratio will obstruct proper flow and increase the chance of wave related defects. Additionally, orientating the board on selective wave pallet at 15° degrees can help mitigate the bridging to a few pins. Typically, a hybrid solution of the above techniques provides the optimal solution. Process Considerations Selecting the right flux for the application as well as the appropriate thermal profile can have a significant impact on the formation of solder bridging, and selecting an appropriate flux for the thermal mass and heating profile required can have a significant impact on over- all yield. Generally, a higher solid content is more robust at higher temperatures and water- based fluxes do not perform as well at higher temperatures and better suited for lower ther- mal boards. Ensuring the pre-heat temperature Figure 1: Bottom side surface mount component heights can drive thicker pallet requirements and further impact the ability of the solder to flow in and out of the pocket.